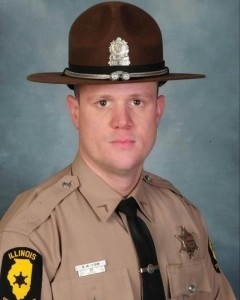 An Illinois State Police trooper died Wednesday of injuries suffered in an Interstate 74 crash involving his squad car and a semitrailer truck near Farmer City. Trooper Ryan Albin died about 8:45 p.m. Wednesday in the hospital, according to a state police statement. The crash happened around 3:10 p.m. The trooper’s canine partner, Biko, who was in the back seat of the squad car, was taken to an emergency veterinarian at the University of Illinois in Urbana, but the dog’s injuries appear to be minor, police told PJStar.com.